I am very eagerly looking forward to Sunday night's game between Indianapolis and Pittsburgh as well as Monday's matchup between Dallas and Washington ( which I previewed here at Doc's ). Not so much for betting purposes or as a fan of one of those teams. I just want to see how those games can top the endings of the past three prime-time NFL thrillers. Last Sunday, the Broncos upset the Patriots in the snow, winning on the final play of the game when C.J. Anderson scored on a 48-yard run in overtime to end the Patriots' chances at an unbeaten season. On Monday night in Cleveland, the Browns lost as only the Browns can, getting a potential 51-yard field goal blocked and returned for a winning touchdown by the Ravens with no time on the clock. And then Thursday night, maybe the most unlikely Hail Mary in NFL history -- and the 61-yarder was the longest ever to win a game. The Packers were dead in the water in Detroit and about to be swept for the first time in 24 years by the Lions. I'm sure you've seen what happened by now as Aaron Rodgers completed the first Hail Mary of his career, throwing it about 70 yards in the air for the shocking TD on an untimed down following questionable Lions facemask penalty kept the game going. Who caught it? Richard Rodgers, whose father was a part of the most unlikely NCAA football ending in history, the "Play" in the 1982 Cal-Stanford game. The elder Richard Rodgers threw two laterals on that kickoff return for Cal. The Packers' Rodgers had more receiving yards on that play than he had in any game prior to Thursday (58). That result was very big, too, because now the Packers (8-4) seem locks for at least a wild-card spot with a two-game lead in the win column over No. 6 seed Seattle (6-5) and No. 7 Atlanta (also 6-5). The Packers will be rooting for Seattle on Sunday against NFC North-leading Minnesota (8-3). Bengals at Browns (+10, 43.5): This line opened as low as 7 at some books but has taken a sizable jump no doubt because Cleveland lost starting quarterback Josh McCown to a season-ending broken collarbone on Monday night. And instead of going back to Johnny Manziel to see if the 2014 first-rounder is worth keeping around after this season, Coach Mike Pettine -- who clearly is just begging to be fired (and he will be on Black Monday ) -- is going with undrafted journeyman Austin Davis at quarterback. Davis looked OK in place of McCown in the fourth quarter Monday and was decent in eight starts last year with the Rams, who were 3-5 under him. But that move still makes no sense. At 2-9, the Browns shouldn't care about who gives them the best chance of winning this season but next. That won't be Davis. 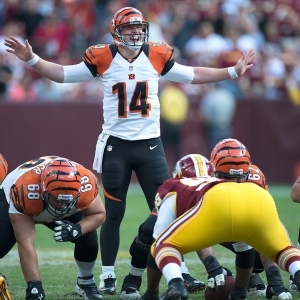 The Bengals have outscored the Browns 61-10 in winning two straight in this series. Manziel happened to start both of those. Cincinnati will likely be without star tight end Tyler Eifert, who caught three TD passes in the earlier meeting this season vs. Cleveland. Falcons at Buccaneers (+1, 46): I examined the Falcons in Monday's Opening Line Report story and how Matt Ryan has been struggling mightily as Atlanta has dropped five of six. I'm not sure why, but the Falcons were 2.5-point dogs then and are now 1-point favorites. Hmm. There are a two injury notes here, but I doubt they are why the line moved (and Bucs are taking a small lean). For Atlanta, top running back Devonta Freeman has been cleared to play after missing last week's loss to Minnesota with a concussion. For the Bucs, Pro Bowl defensive tackle Gerald McCoy, who leads the team with seven sacks, is questionable after undergoing a hand procedure. Atlanta lost at home 23-20 in overtime to Tampa in Week 8, which started the Falcons' current four-game skid. The Bucs only had 290 total yards to Atlanta's 496, but Tampa forced four turnovers and committed none. Bucs haven't swept this series since 2007. Cardinals at Rams (+6, 43): This has jumped a point at some books. It might get all the way to 7 as the Cards are currently taking the biggest lean on the board, so if you want to back Arizona do it soon. Could the Cards be looking ahead to next week's quick home turnaround game against the Vikings in a potential playoff preview (I'll have that game preview for you here at Doc's)? The Rams will stick with Nick Foles as their starting quarterback here. Coach Jeff Fisher said that if Case Keenum clears concussion protocol, he will back up Foles. Keenum had to sit out last week with the concussion. Fisher added Keenum will remain the starting quarterback going forward once he is cleared. Bovada offers a Week 13 special on Fisher on whether he is the Rams' coach next season. "No" is -160 and "yes" +110. There's NO CHANCE unless Fisher buys the team like Warren Beatty did with the Rams in "Heaven Can Wait." I'm dropping big money on that prop. Jets at Giants (+2, 45): The battle for New York -- even though the two play in New Jersey (seriously, make a trick bet with someone when asking how many NFL teams play in the state of New York and bet they don't get it right; the answer is one: Buffalo) -- opened as a "pick'em". We won't get to see a potentially very interesting individual matchup between Jets future Hall of Famer cornerback Darrelle Revis and amazing Giants second-year receiver Odell Beckham Jr. Revis, who is showing signs of age, has been ruled out again with a concussion. That means Antonio Cromartie, who ranks as one of the worst overall corners in the league this year, will be shadowing Beckham. If you are wondering, the NFL single-game record for receiving yards is 336 by Rams' Willie Lee Anderson -- you know him as "Flipper" -- on Nov. 26, 1989. Only throwing that out there.... the Giants' record is 269 by someone named Del Shofner in 1962. After more than four decades handicapping the NFL, at Doc's Sports we know our stuff. We want to give new clients a chance to try our service completely free. Click here for $60 worth of free NFL picks. The sign-up is hassle-free, and there is no obligation. Also, get three handicappers for the price of one when you sign up for a full-season football package! Click Here for details.